Nov 7, 2014 • This Saturday a NASA Climate Change Forum is being held at Howard Community College in Maryland. The forum will focus on urban, agricultural, and forest changes in the Chesapeake Bay watershed that result from development and climate change. The forum takes place tomorrow from from 9 a.m. to noon in the HCC’s Health Sciences Building. 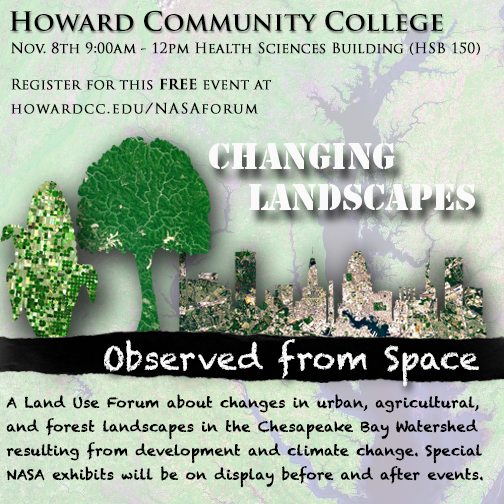 Talks by Molly Brown (NASA) on food security, Peter Claggett (USGS) on the Chesapeake Bay, and Joseph Sexton (UMD) on land use change will be featured along with a panel Q&A, and related exhibits.